Designed as a multi-purpose tool for English language learners. Best if used during or after a course, training, or tutoring of the English language, even if being taught by friends or family. All content is in English. The most common, functional and useful English words and phrases to navigate daily life are included as well as essential grammar usage rules. 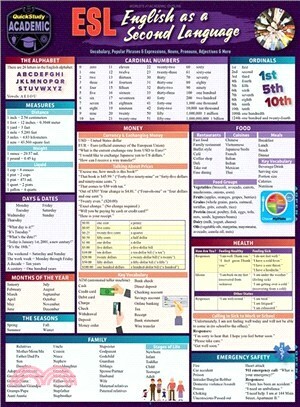 This 6 page laminated guide is handy enough to go anywhere as a cheat sheet reference for speaking English. As a new student of the language this is a must-have, as the learner progresses the guide offers quick access answers for practice until the guide becomes less and less necessary.